If you haven’t seen Extreme Barbie Jeep Racing 2017 then you must not spend much time on the internet. I usually race a few times each year in this insane sport where adults attempt to ride children’s toys down a hill. This time we are taking you to Johnson Valley, California for the 2nd annual King of the Barbie Jeeps that went down during the King of the Hammers event. This was a team event that pitted two Jeep Forums against each other. Jeep Asylum and JK Forum in an all out grudge match. Last year JK Forum took the win so this time Jeep Asylum is coming in hot with some heavily modified power wheels. Now this is an extreme sport and I make sure to wear full padding and a helmet to keep from getting too bad injured. Well the Jeep Asylum guys showed up all wearing kilt. One of the guys from JK Forum was even wearing a red onesie. They were obviously not concerned about injury. After a short drivers meeting the first few were off the line. These things were flying down the hill and so were the drivers. Everything was at stake since this was a single elimination format. That means if you lose you are out of the competition. We had a handful a spectacular crashes and wreck. Check them out and let us know which is your favorite as well as your favorite racer! 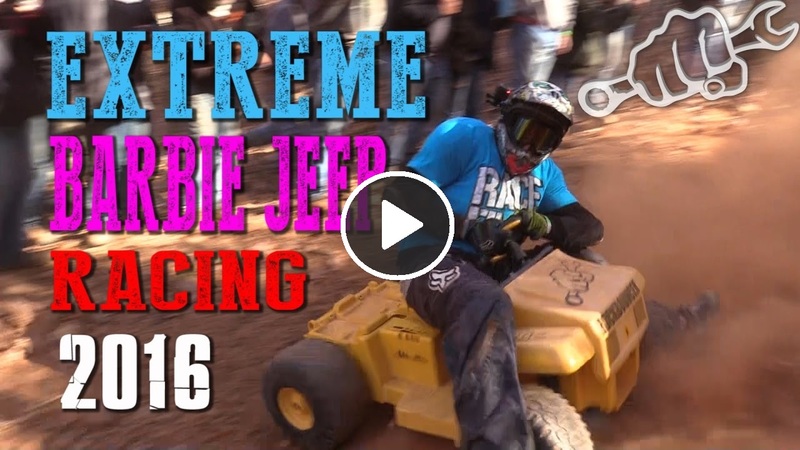 Extreme Barbie Jeep downhill Racing is just flat out Crazy. For more Extreme Barbie Jeep Racing check out the videos below. Also head on over to the Barbie Jeep Racing Facebook Page for more.